Plans were revealed on Tuesday night for a proposed development of up to 150 houses around the former industrial area of Trent Basin, and I went along to have a look. Despite the development being exclusively private housing for sale, I believe the plans have a lot to offer the existing Sneinton community. Above: URBED's proposed masterplan for the site. See more here. The site is at the end of Trent Lane, which connects via the new rail footbridge to the heart of Sneinton. 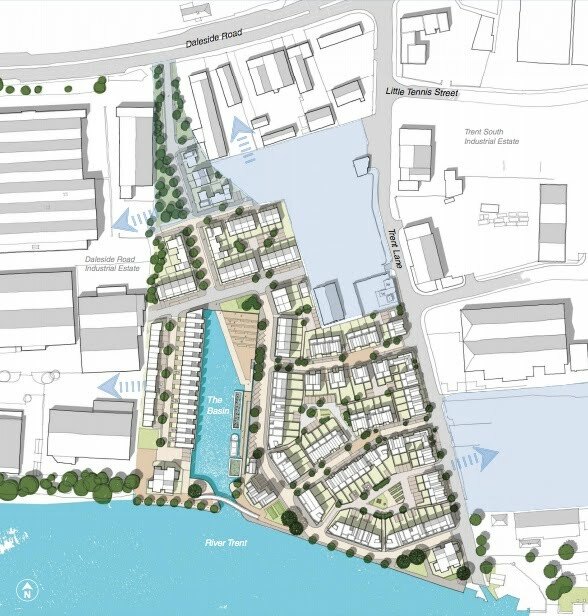 If developed well, this could provide Sneinton with an excellent re-connection to the Trent riverside, so we have every interest in looking carefully at the plans and making sure they work for the Sneinton's existing residents. Judging by the plans on show on Tuesday, the developers Blueprint, architects Marsh Grochowski and especially the urban designers URBED have come up with an excellent proposal. If they manage to stick to these ideas through the planning process and the commercial pressures on the development, they look set to create a great new neighbourhood with generous access to the riverside, liveable streets and pleasant urban spaces. This would be good for the new residents, but for the rest of the Sneinton community it could also offer improved access to the riverside and a blueprint for how to plan new housing developments around the area. The development is realisitically low-key compared to previous boom-time plans for high rise mega developments around the Trent Basin. It seeks to create a low rise, pleasant and liveable neighbourhood for the long term. The street pattern is mostly based on the principle of small scale 'perimeter blocks' of housing- ie with fronts of houses facing the streets and back gardens (with some private parking) clustered together in the middle. The result is active, safe and walkable streets. It's a simple, time-honoured pattern but one is surprisingly easy for developers to get wrong. The streets join up into a network that provides easy access for pedestrians, cyclists and cars alike, making it easy for visitors and residents to get from A to B. So the riverside is well connected to the housing, which is well connected to the rest of the city. Housing which grows up slowly over time tends to do this naturally, but when a whole new area is planned things can easily go wrong. This is a private development, but it connects well to the surrounding area rather than shutting itself off. Developers are sometimes scared that houses will not sell unless the area is gated or has the feeling of being separate from its surroundings- but developments that do this shut people out, create social divisions and actually reduce the safety that comes from having lots of people passing-by. The plans deserve support because they could create an excellent place to live and visit by the Trent, set a high benchmark for other developers in the area to reach, and contain principles for urban development that apply equally to areas of Sneinton (and Nottingham) that really need improvement. A planning application for the initial phase of housing is planned for October. Keep an eye on the Planning website at Nottingham City Council to have your say. You can see more about the proposals on the URBED blog site. If you missed the consultation, you can download the presentation boards and the information banners in PDF format. You can use Sneinton Alchemy's appraisal tool to see how the proposal measures up against the Sneinton Vision, and let us know what you think directly. When you've made up your own mind about the proposals- whether you support them or not, you can give the developers your feedback by completing their survey questionnaire here.